Another positive Reptilian named Turak. To learn more about Turak, go to Ms. Christine Kesara Dennett’s website: http://www.kesara.org/. Illustration courtesy of Christine Kesara Dennett. “Greetings! I Akah, was born of the royal line of Kings and Queens of what you formally call ‘Reptilians’ and the forbears/ancestors of the Annunnaki on Earth (Terra). We were once a very peaceful people millions of years ago. But due to an unforeseen accident/calamity, our star system’s atmosphere had to be supported by gold and/or mono-atomic gold. This led us to scour the galaxies for gold so that our people could survive. I was one of the original contingent. A young spritely officer just newly elevated to the rank of Commander, we scoured countless stars for the elusive gold. And that was the start of our troubles. Millennia passed and countless wars happened. 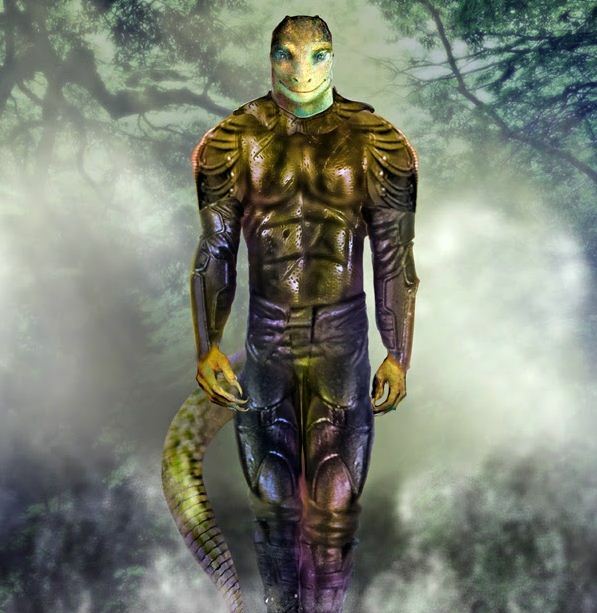 I stand here with the scars of those battles – much wiser, much more serene, much more at peace (here, Commander Akah tells me the story of how he decided to become a positive reptilian, which I had recounted to you guys in Part I of this 2-part blog post). When forced with what you perceive may be indomitable, remember that you came from the line of Kings and Queens. Despite a DNA reconfiguration, you are superb. But they cannot take away the Divine from you. What the Rs didn’t know was that humanity evolves back to where it all started. The DNA that was taken from you can be recovered. All you need to do is manifest it. Like Commander XXXXX (another benevolent entity who is fighting the Rs) who used the ancient sounds and the crystals that her people have been using for millions of years, you can recover your lineage, your lost destiny. There is definitely something happening right now – and if that happening has something to do with our frequencies and that of the frequency of the planet rising, then we are in the best time of our lives right now. To be reminded of our Divinity and how we can recover our lost DNA is something that we can look forward to. Many of our bestselling motivation and self-empowerment gurus like Jack Canfield, Lisa Nichols, Joe Vitale, Bob Proctor, etc. have known this for a long time – that manifesting our future is sometimes just a matter of doing a heartfelt “intention” to manifest that thing or situation we want, and accompany that with the emotion and the positive attitude that it will happily and eventually happen “with the help of the Universe”. But what surprised me at the time of the communication is that there are “positive reptilians”. This has had a major impact on me, because I’ve always thought that to do this mission of mine, which is to wake people to their true divine nature and the real nature of the Matrix that we are in, one has to struggle and fight the Rs to this cause. I was so wrong then. Commander Akah and I have had several conversations after that 1st communication. He did say that he is on a “benevolent mission” now – to help Terran humans be free from the clutches of the Reptilian-controlled Illuminati government. He said that not all Reptilians agree with the Illuminati-controlled government of nations here on Terra. That is why he is also doing his part to reverse this “control” on the peoples of Earth by the negative Rs and their human “partners in crime” on this planet (You can read Alex Collier’s Youtube videos and book, “Defending Sacred Ground” on more of the Illuminati). Likewise, I myself need to reconfigure my mind and be more positively focused. The future, as Commander Akah said, is definitely looking bright ;). With Gaia’s help and the arrival of thousands of lightworkers currently incarnating on the planet, we are on our way to a most positive and lovely future ;)! This entry was posted in 5th Dimension, Hacking the Matrix, interdimensional communication, lightworker, manifest a positive reality, multi-dimensional worlds, Reptilians, Shamanism, Shifting the timeline, Spirituality, The Matrix and tagged 5th dimension, Akah, Alex Collier, Christine Kesara Dennett, extraterrestial beings, Gaia, higher dimensional beings, Illuminati, negative entities, Raising our frequency, Reptilians, spirituality, Turak. Bookmark the permalink. Sorry but the Annunnaki are evil. If this being is of the forebears of the Annunnaki then he is a negative being. They like to make humans believe they are good, while they’re agenda is human annihilation. Humans are very gullible and can be convinced to believe anything. Namaste Luz! Thank you for your comment. I respect your opinion of the Annunnaki. But there are 5 types of Annunnaki — and not all of them want to eat our hearts, drink our blood, and feed on our negative emotions and thoughts ;). It’s like what we humans do here also in 3D Terra — judge a race, whether you are Black, Asian, Jewish, Latino, etc. by the color of your skin, country, belief system, etc. Not all Annunnaki are evil. They are also from The Creator or The One. And like the Creator’s children, everyone also evolves according to their higher life purpose. I hope you only get to encounter the positive Annunnaki. But if you do encounter the negative ones, remember that they cannot impact on you if you remain positive and vibrating highly in your frequency. Namaste Luz and have a smashing day :)! VERY TRUE. I MYSELF MET BENEVOLENT ORIGINAL REPTILIANS AND THEY ARE NOTHING LIKE THE ONES HERE. THE ONES HERE HAVE TO BE MIXED WITH SERPENT DNA. THE ONES I SEEN LOOK MORE LIKE HUMANS INSTEAD OF SERPENT FEATURES . NO SLIT EYES. MAYBE THE SATAN SERPENTS DECIDED TO MIX DNA WITH THEM AND IT DIDNT WORK OUT VERY WELL. I KNOW BECAUSE THEY TAUGHT ME A LOT AND TRAINED ME SO MUCH TO THE POINT IBKNOW I AM AN ELDER NOW. I USED TO HELP PROTECT A QUEEN AND THEY SHOWED MUCH PATIENCE WITH ME AS IF I AM APART OF THEM (in which i am) TRUST ME. THE ORIGINAL REPTILIANS LIVE ON A HIGHER PLANE. THEY WOULDNT EVEN CREATE THIS THOUGHT. THIS IS A THOUGHT FROM LOWER DENSITIES. HOPEFULLY WE CAN DESTROY THIS ILLUMINATI GOVERNMENT AND RESTORE THE EARTH CHAKRAS. Namaste Reincarnated Elder :)! It is good to hear from a fellow lightworker :). Apologies for my tardy response; I have been away for a while but it’s good to be back online :)! I am glad you’re in contact with the more positive R, as we like to call them. I agree with you on the Illuminati agenda. I’m not sure who the “original Reptilians” are. As I had narrated in my blog post, the ancient Rs also were a peaceful race like some of the other races in the galaxy. But along the way, a certain faction lost their higher frequencies and became what you know now as the negative Rs. But like us Earth humans, we cannot classify all Rs as “negative”. There are positive, peace-loving, and vegetarian Rs. It is a matter of evolution — and like us — personal evolution when people also look for their higher purpose and follow that. Because Terra’s frequency is also ascending, all Terra’s inhabitants including the Rs, are also going through this massive transformation of raising one’s frequency. And that is probably the reason why you are incarnated here on this plane of existence on Terra :). Peace and love & light to you my fellow lightworker :). Namaste! It would be interesting to watch and see how this will turn out :).